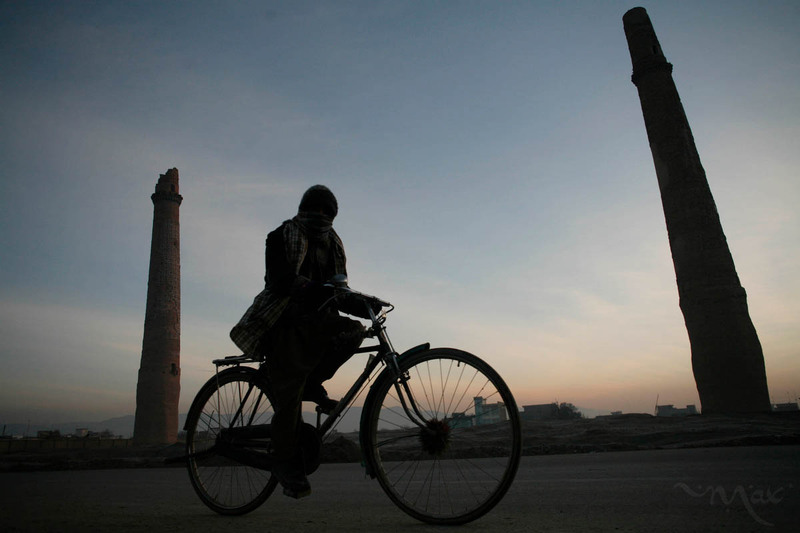 Morning commuters travel past ancient minarets originally built around 1417 in the city of Herat in western Afghanistan. The minarets were part of a prayer complex which included a mosque, a madrassa, a mausoleum _ all decorated with ornate mosaic tile work. But most of the complex was dynamited by the British in 1885 to prepare for a possible Russian advance that never happened. Most of the elaborate tile work has gone, leaving remnants of its former glory. Since 2001 UN funded projects have worked to stabilize the remaining structures and local tile workshops have begun to rebuild some of structures.